How to Subscribe for a Kanbanize Account? How to Renew your Annual Subscription? How to Upgrade your Annual Subscription? How to Upgrade your Monthly Subscription? How to Downgrade your Subscription plan? How to View and Download your Invoices? How to Change your Payment Details? What happens if you miss to make a payment? How to Cancel your Kanbanize subscription? The Payment Panel is the place where you can view and manage your Kanbanize subscription and payments. Only users with "Account Owners" and "Make Payments" privileges have access to the Payment Panel in Kanbanize. 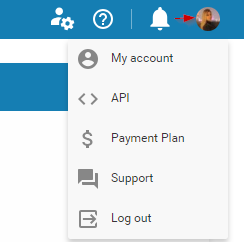 To access it, click on your avatar at the top right side of your board interface and select Payment Plan. - Number of Users - our plans are based on different tiers of users with the lowest one being for up to 15 users. * The payment calculator instantly displays the amount of your payment based on the options you choose. 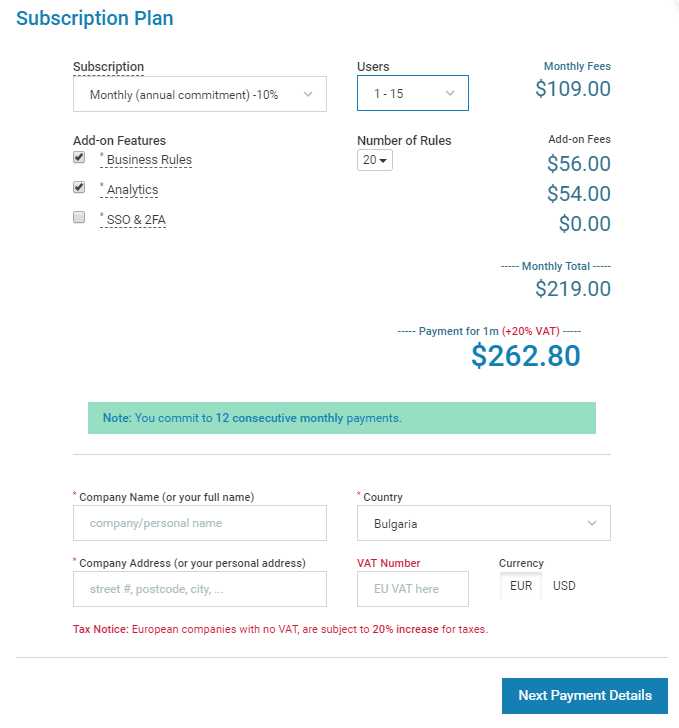 At the bottom of the panel, you have to fulfill your company details and proceed further with Next Payment Details to complete with the subscription process. Note: annual plans are not automatically renewed. The system will notify you 45 days before the due date, so users with relevant permissions have to manually proceed with the annual renewal process. From the Last Invoice|All button -> users get access to their Invoices.